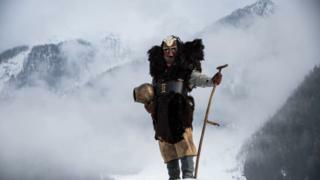 Once a year, as the last icy blasts of winter begin to give way to spring, strange figures start to appear in the remote Swiss valley of the Lötschental. 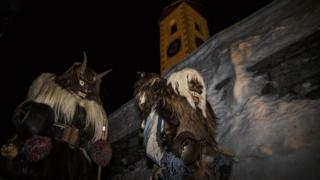 Clad in animal skins, with huge cowbells round their waists, and wearing fearsome wooden masks, these are the Tschäggättä. Local man Manuel Blötzer remembers how he felt, as a little boy, when he first saw them. "Frightened… but I wanted to see them. Where did they come from in the night? From above the mountains? Where did they go? I didn't know." 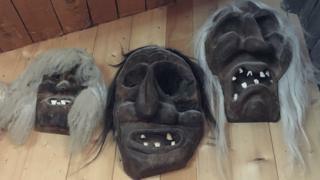 The origins of the Tschäggättä tradition remain shrouded in mystery, but the art of mask making is alive and well. 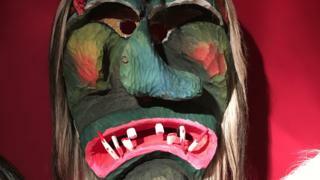 In his tiny workshop, Albert Ebener has been making masks for half a century. 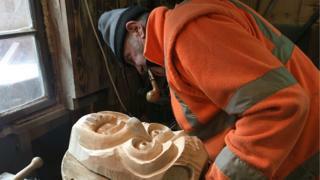 Today, as he carefully cuts and carves the wood, a terrifying face begins to emerge. 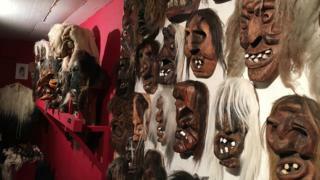 On the walls around Albert, masks made by his father and grandfather, complete with real teeth and hair, stare balefully down. "I think it was probably a pagan ritual," he says. "Something to do with the sun, and chasing winter away." 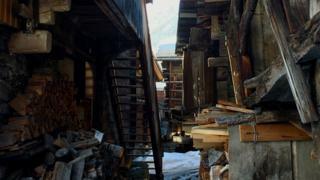 A walk through the tiny Lötschental village of Kippel reveals more clues. It has changed little over the centuries. 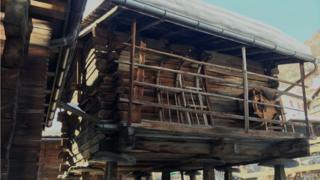 Wood is used not just for those masks, but for the houses, many propped up on stilts to keep mice at bay. Firewood, still essential protection against the bitter winter cold, is stored beneath. This was once one of the poorest regions of Switzerland, points out Adrian Schnyder of the local tourist board, and simple hunger could, he thinks, be at the root of the Tschäggättä legend. "There is the story of the 'Schurtendiebe'," he explains. 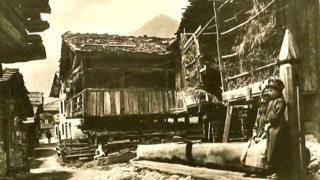 "People who lived on the shady side of the valley and didn't have enough to eat." "So they came over to the sunny side, where people were richer and had more food - to steal. And they wore masks to disguise themselves." Inside Kippel's museum, the mask tradition is gloriously represented: dozens of masks dating back to the 18th Century are on display. But as anthropologist Thomas Antonietti points out, none earlier than that: "They were made of wood; after they had been worn they were often burnt." Over the long dark winters, new ones could always be made. Thomas explains that whatever the original truth about the Tschäggättä, the tradition became deeply enmeshed in the life of the Church. 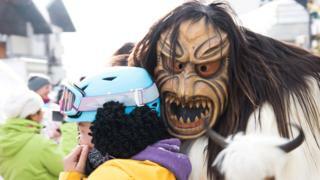 The animal-skinned, mask-wearing figures started to appear around Candlemas at the start of February, and their presence in the village streets reaches a peak even now on "Fat Thursday" at the end of the February carnival. "It was a moment when young unmarried people had a chance to meet," Thomas explains. "When the young men, disguised, tried to meet the girls. Like flirting… because once you were married it was finished." Inside a traditional Tschäggättä "Dorf Keller", 25-year-old Manuel Blötzer prepares for "Fat Thursday" himself. The locations are often kept secret, but once inside, this building is a surprise. 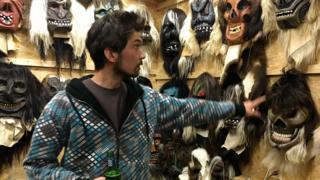 Dozens of masks and racks of animal skins, but also several cases of beer and a powerful stereo system. This is where Manuel hangs out with his friends. His Tschäggättä dress ritual involves burlap trousers that stretch right over his shoes. In poor villages where everyone had only one pair, shoes were a key giveaway. Then a frame that goes over his head and shoulders to make him look bigger; a sheepskin; a cowbell round his waist, and finally the mask. Now is he ready to go out looking for a girl? "No, no," he laughs. "We're modern here like everywhere else." While being a Tschäggättä was once confined to young men, nowadays everyone takes part: women and men, young and old. Off he goes into the night, wearing a mask he carved himself, and joined, as he walks the village lanes, by other fearsome figures. They may chase an unsuspecting tourist, and even rub the odd face into the snow, but the real purpose is to have some fun, and to keep a unique tradition alive. Photographs are subject to copyright.